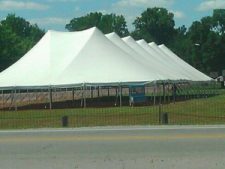 At Byerly Tent Rental we offer both frame tents and pole tents to meet a variety of needs. 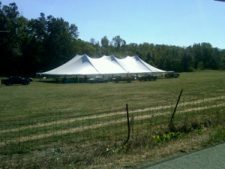 Tent walls are also available for rent. 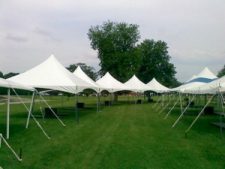 The difference between frame tents and pole tents is something to keep in mind when choosing the best tent for your event. We also offer a variety of other rental items to help your event go off without a hitch, such as tables, chairs, dance floors, and heaters. 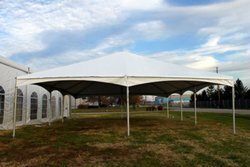 Frame tents are free standing and can be erected on many different surfaces, including asphalt, concrete, grass and wooden decks. 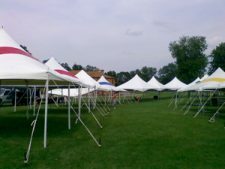 Unlike pole tents, free-standing frame tents do not require the use of poles to hold up the tent’s ceiling, so the square footage within the tent is completely unobscured. 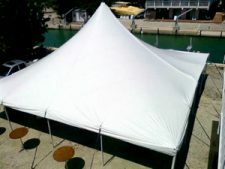 The tent’s frame is made up of an aluminum framework which is visible on the tent’s interior, but you or your event planner can cover the framework with decorative materials like fabric if you so choose. 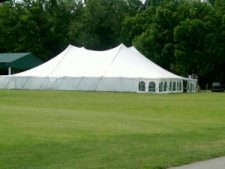 However, Byerly Tent Rental does not provide that service. 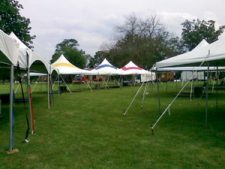 Byerly Tent Rental offers frame tents in a variety of sizes and colors for events such as backyard parties, craft fairs, farmer’s markets, and small-to-medium-sized outdoor events of all kinds. Pole tents are not free standing and must be anchored by driving stakes into the ground in order to secure the tent. 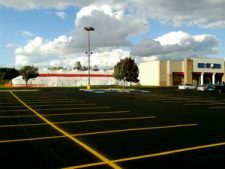 For this reason, pole tents are best suited for grassy areas, but they can also be used on asphalt surfaces, provided we are given permission to drive stakes into the surface in order to properly anchor the tent to the ground. 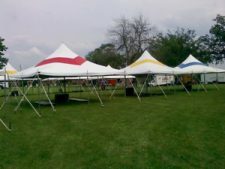 Pole tents include at least one center pole within the interior to hold up the tent’s ceiling. The location of center pole(s) will need to be taken into consideration while planning the placement of tables, chairs, stages, dance floors, etc. 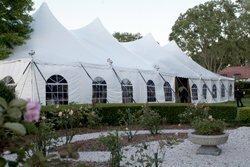 Byerly Tent Rental offers a variety of tent walls. Tent walls are great additions that can help add to the aesthetic appeal of any tent. 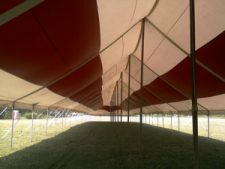 Tent walls can also help with the overall traffic flow in and out of the tent, as well as helping to retain heat for outdoor events occurring in the early spring or late fall. 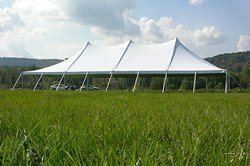 Tent walls are both aesthetically appealing and functional and come in a variety of styles, including standard, french windows, and mesh (great for allowing air to flow freely, while still keeping flying insects out). 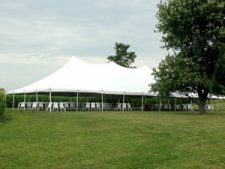 Call us at (765) 724-7707 or email service@byerlylimited.com today to discuss your tent rental & event equipment rental needs… don’t forget the tables and chairs! I would recommend your services to anyone!! I wanted to thank you for your wonderful work in helping us make my mothers birthday so special, the tent was perfect! I would recommend your services to anyone!! Thank you so much for assisting me in planning my wedding. Your help setting up was greatly appreciated. Thank you for your recent $100 YMCA donation. Your gift ensures those less fortunate have an opportunity to participate in life changing Y programs. I appreciate all you do for the Y and our community. Thank you very much for delivering chairs to the Chinese Gardens for our wedding! We were very pleased that you called before delivering the chairs due to the weather. That consideration from your company was most appreciated by both of us!! Once again, thank you very much!! Thank you for the great tent, tables and chairs. We were all very comfortable and had a great time. We will refer you to others. 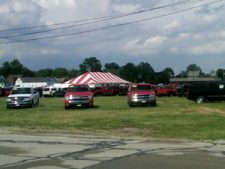 Thank you for your generosity in providing a discount on the tent for Oktoberfest Fundraiser benefit cancer patients in our community. Every dollar saved went straight to help people in need. Thank you so much for the bounce house. The children loved it and the event was a huge success. I just wanted to say thank you so much for working with us and helping us get it all straightened out. I really appreciate it and my future mother-in-law was very happy with coming in and talking to you guys. She said that you guys were so nice! You guys are awesome! Thanks for such a fabulous experience. You were so professional, kind and considerate with all our wedding plans. We loved working with you and will recommend your business to everyone!! Thank you so much for the tent, tables and chairs for our event. Everything looked great! By the way your staff is FANTASTIC! Working with them was a pleasure & has made this whole process easy. I can not put into words the blessing your gift of kindness brought to our church and 200 children. As a matter of fact, it would have been impossible for us to have the Kid’s Carnival with out the tent. Not only did it provide the needed room for the event, it made the atmosphere seem like a real carnival for the children. They all loved it and our church family was blown away by how it looked and how the carnival went. What would we have done with out a tent? I really do not know. From the bottom of my heart and a very appreciative church family we say THANKS SO VERY MUCH!! Thank you for your help with the dances and for always going above and beyond for us each year. We appreciate you. Thank you for your generous help of a tent, tables for use during our Christmas Toy Drive Rummage Sale. Despite the bad weather it was pretty successful. You always help me when in need. Well, we pulled it off again! This year’s picnic was a huge success. Thanks to all you and the rest of the Byerly staff for your professional help. 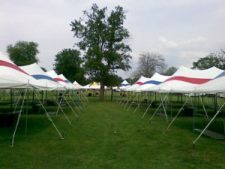 Each year Chris does a great job in setting up the tents… he certainly has it down to an art and he is so courteous. 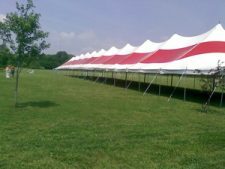 We also deliver and set up large tents in and around Metropolitan Indianapolis & surrounding suburban areas, including Fishers, Geist, and Carmel; and other areas of Central Indiana like Ft. Wayne, Terre Haute, and French Lick.